We have always been a country of haves and have nots. In 1937 John D. Rockefeller had a net worth of $1.4 billion, or 1/65th of U.S. GNP. Today, the three wealthiest people in America, Bezos, Buffett, and Gates, have as much money as the bottom half of the country. With a net worth of $325,000,000,000, these three individuals have as much money as 160 million people, or 63 million families. These numbers are so incomprehensibly large that they lack any meaning. It’s like saying that Pluto is 4.67 billion miles away from the earth. Some things are so ridiculous that they cannot be wrestled into perspective. Capitalism is a dynamic force where change is the only constant. The old is displaced by the new, which is why the system flourishes. It gives birth to innovation and new technologies and better jobs. But with all of the wonderful things that it has has delivered, it isn’t perfect, and one of the nasty byproducts of free market capitalism is power ultimately becomes concentrated in the hands of the few. There are a lot of economic problems that we’ll face in the coming years. Unfortunately, there are no easy solutions. One of the ways in which these challenges will manifest themselves are a continued division of our country, with politicians on both sides going further out on the tribal spectrum. In Christopher Leonard’s book The Meat Racket, he writes, “The average per capita income in Waldron and surrounding Scott County has stagnated in Tyson’s shadow, growing just 1.4 percent over the last decade, to about $22,000. During that time, Tyson’s annual income rose 245 percent.” This story has played out in different counties and in different industries all across our country for the last couple of decades. There are too few with too much and too many with too little. People are mad and they’re looking for someone to blame. Share buybacks are the scapegoat. Before we address the fallacious narratives surrounding buybacks, let’s understand why they’re being blamed in the first place. Things are tough for aging Americans. The median retirement account balance of people ages 56 to 61 is just $25,000. People aren’t saving enough in their defined contribution plans (401(K), IRA), and defined benefit plans (pensions) are in serious danger. I took the data from that article and created the chart below. 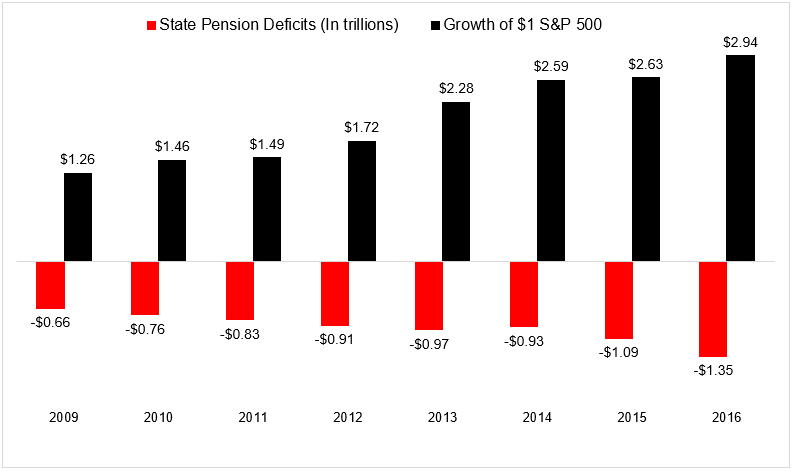 This shows that pension deficits have increased 14% a year for the last eight years. Over the same time, the S&P 500 has also grown 14% a year. If the deficit exploded while stocks were in a raging bull market, it’s scary to think what might happen if and when returns slow down. 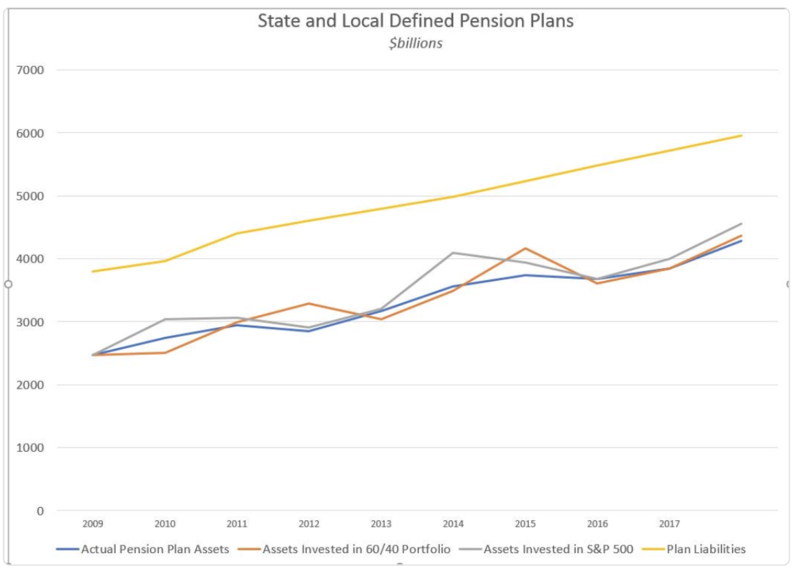 Like many of life’s problems, the pension deficit looks like it is suffering from a severe case of over promising. “Today, retired police and firefighters are wrestling with the consequences of agreeing to cut their monthly pension checks by as much as 55% when the town was working to escape insolvency.” What happens when people who spent their entire life doing what they were told find themselves in a situation where they can’t make ends meet? I’m afraid we’re going to see an avalanche of stories like this in the coming years. The financial problems aging Americans are experiencing will be exacerbated by the fact that people are living longer. Life expectancy was 69.77 in 1960. There were 10.3 million people over 70 in 1960, which represented 5.7% of the population. Today, life expectancy is close to 80, and there are 34 million people over the age of 70, which represents 10.5% of the population. I’m much more sanguine on millennials than most articles written about them, but there is little doubt that getting married and buying a home and having kids is a bigger financial burden for us than it was for our parents. In 2016, 2.2 million workers in the United States earned the minimum wage or below (data from the Bureau of Labor Statistics). While this represents just a small slice of the working population, another 20.6 million people are “near-minimum-wage” workers. Unfortunately for these people, the minimum wage has not increased since 2009, nor, to state the obvious, has it kept up with inflation. 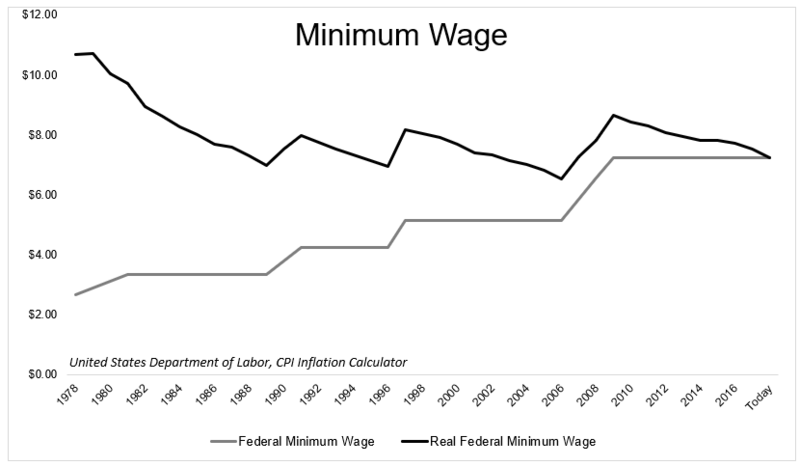 According to the Pew Research Center, adjusted for inflation, the federal minimum wage peaked in 1968 at $8.68 (they use PCE as a deflator). But not all states follow the federal minimum wage, in fact 29 states covering 61% of workers 16 and over have a higher minimum wage than $7.25. And in 12 states, the minimum wage rises automatically each year based on a cost-of-living formula. 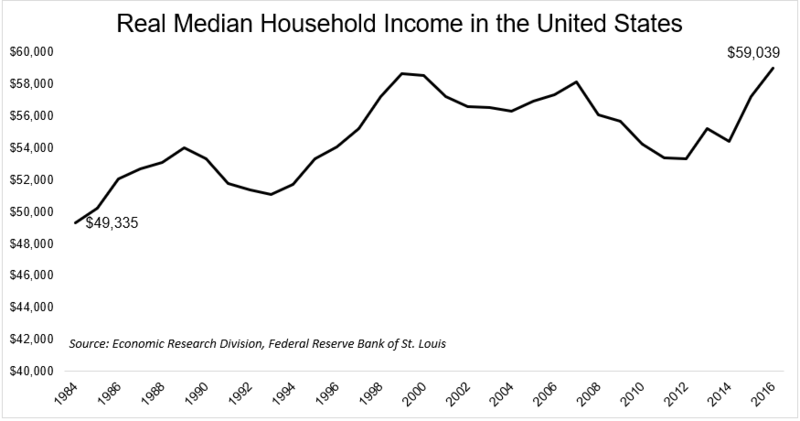 You can see this erosion in the chart below, which shows the real median household income in the United States. Since 1984, it has grown at 0.56% a year, while real GDP grew 2.7% annually over the same time. The S&P 500 total return adjusted for inflation grew 8% a year over the same time. Here is a similar chart broken down by different groups. Some of the data points coming out about how strapped for cash people are is terrifying. 78% of full-time workers said they live paycheck to paycheck, according to a career builder survey. 56% of respondents save less than $100 a month. According to a report from the Federal Reserve, 44% of adults said they wouldn’t be able to cover an unexpected bill of $400. The average American doesn’t earn enough money, period. 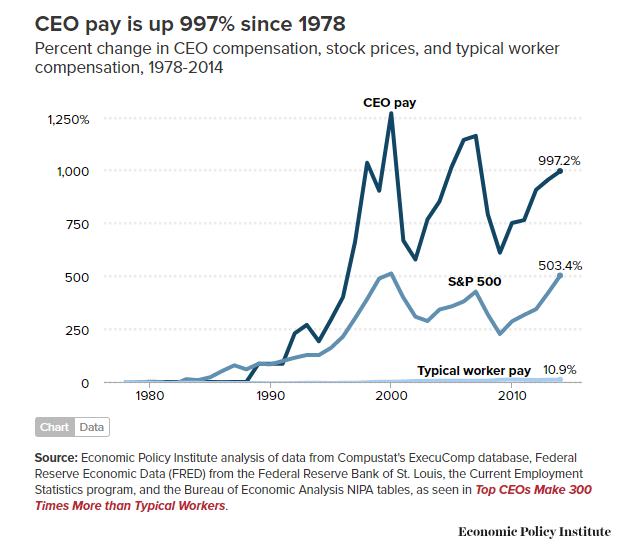 CEO pay has exploded higher in recent decades, with a large percentage of that increase coming in the form of company stock. According to a Deloitte article, in 2012, 500 of the highest paid executives received an average remuneration of $24.4 million, of which 52 percent was in the form of stock options and a further 26 percent was in the form of stock rewards. If you want to point fingers, point them at the compensation committees who decide what these people get paid, and point them at politicians who make the rules. Here is an excerpt from The CEO Pay Machine, emphasis mine. Legislation often backfires because the majority of congressmen are lawyers who try to fix most things through imposing procedures and regulations rather than altering incentives. These lawyer-legislators prefer to force the sinner to repent rather than making virtue more attractive. Perhaps they ignore incentives, since in their careers, they have experienced only two: bill more hours and get reelected. The SEC believes that “sunlight is the best disinfectant”–disclosure is the cure for everything from insider trading to cancer. Had they hired a few gardeners to complement their staff of brilliant lawyers, they might have learned that sunshine also makes weeds grow. As the SEC required more disclosure about CEO pay, pay increased relentlessly because more disclosure made it easier for everyone to know what everyone else was making–and to leapfrog to the next higher level. We can quibble over whether there is an income inequality issue or a wealth inequality issue, but the fact is that the people at the top have too much and the people at the bottom have too little. 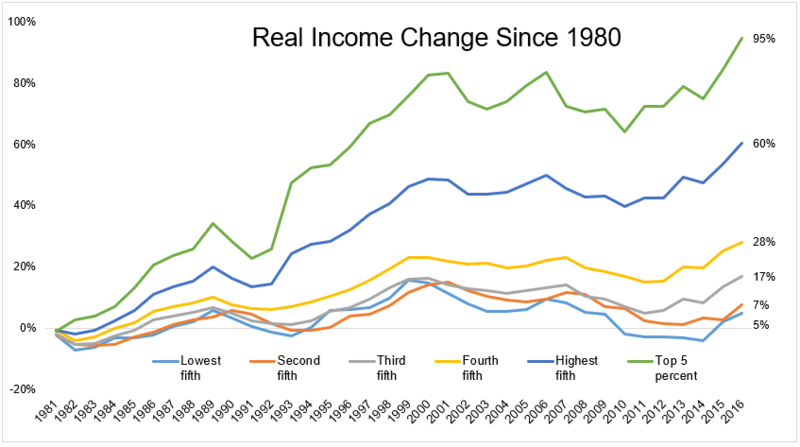 The top 0.1% had less than 10% of the total pie in the 1970s. Today that number has risen to near 25% and will soon pass the wealth had by the bottom 90% of the population. You don’t have to be a social justice warrior to identify that there is something seriously wrong with this picture. Most of the wealth inequality can be seen by an x-ray of who owns the stock market. 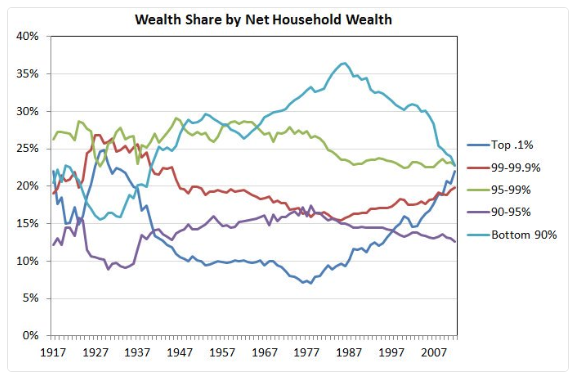 According to research done by NYU economist Edward Wolff, the top 10% of American households, as defined by household wealth, own 84% of all stocks. The average household in the top 10 percent of today’s wealth distribution is almost three times as rich as the average household in the top 10 percent of 1971’s distribution (Noah Smith). How wide can this gap get before people start to revolt? Scott Galloway said “I believe few things could better predict our social fabric unraveling than Apple hitting $2T in value.” There might be some hyperbole here, but at what point do the many go after the few? Which leads us to share repurchases. There are all sorts of economic problems plaguing our society, and people are understandably looking for someone or something to blame. It seems like the target has landed on the back of share buybacks. I believe this is misguided. The story goes that buybacks are used by executives to manipulate share prices higher, because a large piece of their compensation comes in the form of stock. Furthermore, buybacks are coming at the expense of things like wages today and investment in the future. I’m going to try, as many have before me, to shine a little light on this often misunderstood topic. Since Apple hit the trillion dollar market cap, articles have been more aggressive and less factually accurate. In Apple’s Stock Market Scam, the author writes “Apple’s recent success on Wall Street isn’t due to its technological innovations or its sleek products. Instead, its stock has been juiced by a record-breaking number of buybacks, in which the company buys shares of its own stock, causing the supply to drop and the price to rise.” Where to begin with this one? I suppose the $56 billion in profits Apple earned over the last twelve months has nothing to do with the stock’s success. If buying back shares are all there is to increase the share price, why would companies do anything else? But of course it’s not that easy. Since 2010, IBM and General Electric have spent $95 and $72 billion respectively on share buybacks. Over this time, IBM’s share price has gained 11%, General Electric’s share price has declined 14%. The S&P 500 price index has gained 156% over the same time. The Atlantic asks Are Stock Buybacks Starving the Economy? They cite a study that looked at share buybacks in the restaurant, retail, and food industries from 2015 to 2017. First of all, three years is hardly enough to draw any conclusions in the stock market, and second of all, the businesses they looked at employ more minimum wage workers than any other industry. So when they come to the conclusion that instead of repurchasing shares, “Lowe’s, CVS, and Home Depot could have provided each of their workers a raise of $18,000 a year,” it’s just a bizarre leap to make. A leap that is completely divorced from the reality of economics or competition or supply and demand or basic corporate finance. Then just a few days after this article came out, we saw another one titled Ban share buybacks. In it, the author writes, “We need big, aggressive moves to club down corporate profits, and start directing that money back into the country as a whole. Banning buybacks is a simple and straightforward way to get started.” This is a fallacious belief. First of all, many of the things he said in the article are just incorrect, but the simple fact is that buybacks and investing for the future and paying employees today are not mutually exclusive. Why do companies buy back shares in the first place? When companies are profitable, they have a few options: They can hold these profits in cash (short-term securities), they can invest in future projects, or they can return cash to shareholders through dividends and or buybacks. The anti-buyback arguments are being used as a political weapon. They’ll cite the fact that companies are going to buy back $1 trillion in stock this year, due to the excess cash provided by the tax cuts. There is more than a kernel of truth to this, but remember not to be blinded by denominator bias. These sort of numbers will always grind higher as the economy grows over time. 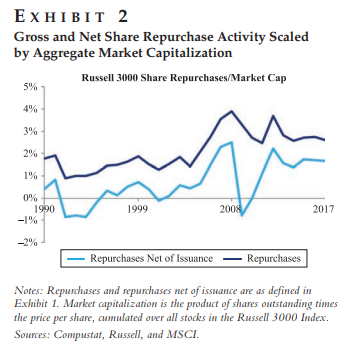 AQR wrote about this in Buyback Derangement Syndrome, where they showed that while share repurchase activity is at an all-time high in dollar terms, when you adjust for repurchases as a percentage of market cap, the picture looks much different. Share repurchases are not being done in lieu of future investments, as you can see in this chart from Haver Analytics. 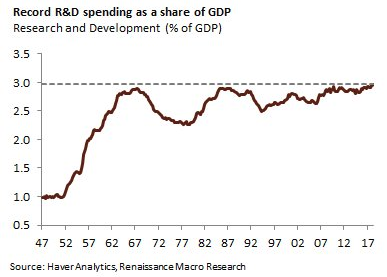 To the contrary, there is record spending on R&D as a percentage of GDP. Mary Meeker showed something similar in her latest slide deck. 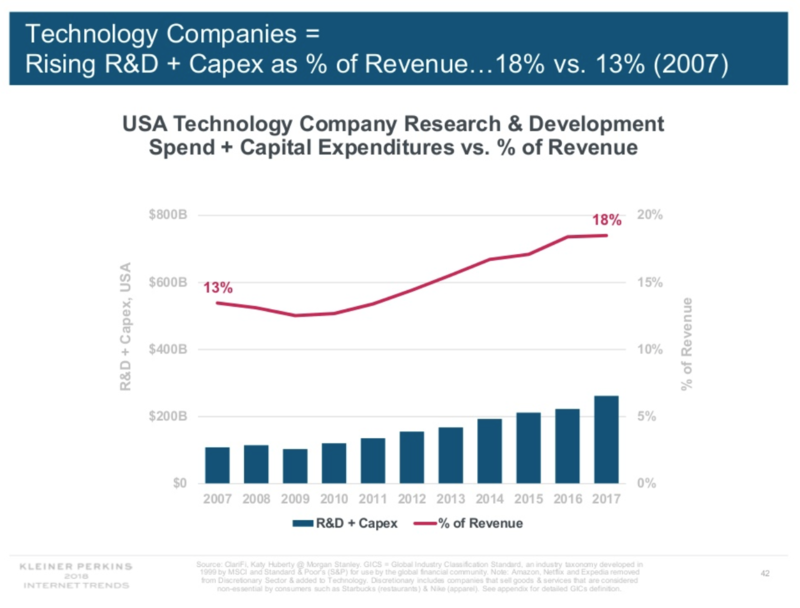 Tech companies, the companies making the most money and conducting huge buybacks are in fact spending 18% of their revenue on R&D and Cap-ex, up from 13% in 2007. 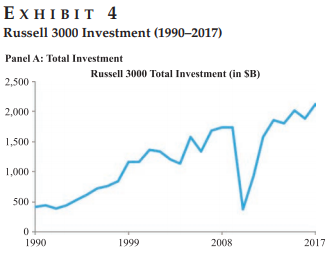 Finally, this chart from AQR shows that total investment in dollar terms, now I’m guilty of using nominal figures, has never been higher. These articles are pounding the table on the fact that companies are manipulating the stock as opposed to investing in the future. However, the academic literature has shown that higher investment does not lead to higher returns. One example from Jack Vogel shows that GM spent $67 billion on R&D and capital expenditures in the 1980s and was left with an equity value of $26.2 billion. GM could have bought Toyota and Honda and still had $40 billion to spend. There is a strong incentive to keep the money in the firm and invest it on lousy projects. What CEO wants to say “we didn’t have any good ideas, so we gave the money back to shareholders!” No! Build solar-powered spaceships to the mars colony! This, in fact, is the classic “agency” problem that managers are prey to: using corporate cash in unprofitable expansions and investments that make the CEO look good but lower the value to shareholders. And now politicians chime in and want you making even worse investments, and excoriating you for giving shareholders back some of their money. Any time you’re yelling about buybacks, replace it with the word dividend and see if the argument still makes sense. After all, they are economically equivalent to both the company and the shareholders. If you’re curious to learn how the math behind this, read this piece from Econompic. However, while buybacks and dividends might be economically equivalent, they do provide executives with different incentives, and incentives are what drives decisions. According to an article, Eye-popping payouts for CEOs follow Trump’s tax cuts, SEC commissioner Robert Jackson said “twice as many companies have insiders selling in the eight days after a buyback announcement as sell on an ordinary day.” Does this really surprise anyone? SEC rules state that companies are unable to buy back any shares during the five-week period which ends two days after the company’s results are released. It would make sense that this rule also apply to executives within the company. If you announce a share repurchase program, you should be restricted from selling your stock for 30 days, or something like this. We have plenty of economic problems in this country, but buybacks are not the reason for our problems and eliminating them is not the answer. I am not on a crusade against capitalism. The alternatives, socialism or communism have proved time and again to be a failure. Capitalism is a big reason why the United States is the most powerful country in the world, and why I can order a car to pick me up on my handheld computer. I consider myself very fortunate to have been born here, and there is no place I would rather live and raise my children. However, I do think we are going down a dangerous path. The quality of life in the 21st century is light years beyond what people experienced in the 19th century, but people compare themselves with their neighbors, not with their ancestors.